Observers of Lake Michigan one day in January of 1935 must have thought they were hallucinating. Not only were the top two levels of a 12-sided house crossing the lake from Chicago to Indiana on a barge, but that house also consisted almost entirely of glass. The sight of the transparent dodecagon cruising toward a specially built pier would have dazzled anyone standing on the beach in the newly created residential area of Beverly Shores, Indiana, the barge’s destination. 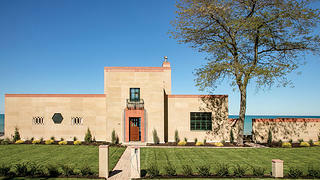 Developer Robert Bartlett had purchased this house and four others from the Century of Progress International Exposition for the 1933–34 World’s Fair in Chicago. Bartlett’s brother, Frederick, had started work on Beverly Shores in the Roaring Twenties, and the stock market crash of 1929 hadn’t been great for business. So, after Robert bought out his brother’s share in 1933, he bought five of the fair’s 11 demonstration houses to move there as a marketing stunt. “In the middle of the Depression, he wanted to get people’s attention,” says Judith Collins, historical architect at the Indiana Dunes National Lakeshore. The houses, now owned by the National Park Service (NPS) as part of the Indiana Dunes National Lakeshore and leased by the preservation nonprofit Indiana Landmarks, still occupy their prime lakeside property. All of them have been restored—except for the House of Tomorrow, a National Treasure of the National Trust. But that, thanks to an innovative partnership between Indiana Landmarks and the park service, is about to change. 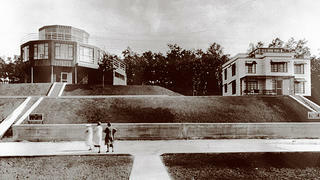 The House of Tomorrow (left) and the Armco-Ferro House, after they were moved to Indiana. 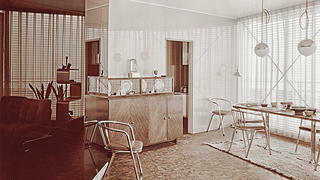 The furniture inside the House of Tomorrow in 1933 was designed by Keck and Keck. The House of Tomorrow's original metal kitchen cabinets are still intact and will be restored as part of the rehabilitation. On my visit to the Indiana Dunes, angry whitecaps roil the gray-green lake. I’m here on the annual, always-sold-out Indiana Landmarks tour of the Century of Progress houses, and visitors stream in and out of the buildings, undeterred by overcast skies. A tour attendee who grew up going to Beverly Shores in the summers tells me he once peeked into the windows of the Florida Tropical House, unable to restrain his curiosity. “Sixty years later I go in, and it’s still the same,” he says. Thirty miles across the lake, just before the blocky skyline of downtown Chicago, lie Burnham Park and Northerly Island, the sites of the Century of Progress exposition. The fair jolted people out of their Depression-era doldrums. Attractions such as the Sky Ride (a transporter bridge with rocket-shaped cars), the 200-foot-tall Havoline weather thermometer, and the scandalous fan dancer Sally Rand brought in millions of visitors, and the 1933 fair ended up being so financially successful that the organizers decided to extend it through 1934. One of the most popular attractions, seen by a total of 1.5 million people, was the Home and Industrial Arts Group, a collection of 11 “homes of the future” sponsored by building product manufacturers and other organizations. The idea was to highlight materials and construction methods that could help make houses cheaper, easier to build, and better suited to modern lifestyles. The Armco-Ferro House, for example, made of prefabricated steel panels with a porcelain enamel coating, was built for the American Rolling Mill Company. 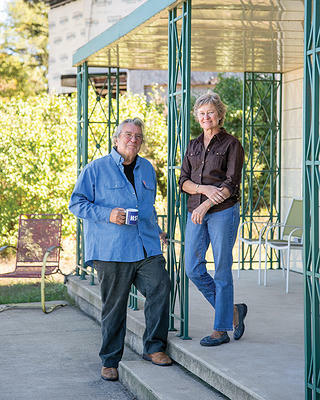 The Southern Cypress Manufacturers Association built a log cabin to show the versatility of—you guessed it—cypress. Other manufacturers highlighted glass block, synthetic wood and stone, reinforced brick, and different types of steel. The state of Florida took the idea even further, building the flamboyant Florida Tropical House to advertise the joys of living in a warmer climate. Newfangled home appliances such as a washing machine and an extra-large mayonnaise mixer were highlighted in a neighboring exhibition hall. But nothing could top the House of Tomorrow, which featured a built-in hangar containing a propeller plane. A brand-new Pierce Arrow Silver Arrow was parked in its garage. (Cross-promotion was alive and well in 1933.) The house’s floor plan flowed in a circle around a central staircase, rather than the more linear plans most people were, and still are, used to. It contained one of the first dishwashers ever used in a residential application, an innovative “iceless refrigerator,” and an early central air-conditioning system. And the third floor held a glamorous, ocean-liner-like deck that continued all the way around the building. “In planning, in shape, in decoration and in furnishing this is a dwelling which presents a radically different face to the house-minded world,” wrote the Chicago Tribune. Plus, the House of Tomorrow was almost completely transparent. Visitors to the first World’s Fair, in London in 1851, had been transfixed by the glass-and-iron Crystal Palace. Now here was the first glass house in the United States, available for self-guided tours to anyone who could pay the 10-cent admission fee. One of those tourgoers was rumored to be the architect Philip Johnson, who would go on to complete his own Glass House (now a National Trust Historic Site) in New Canaan, Connecticut, in 1949. 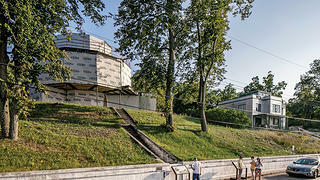 The House of Tomorrow and the Armco-Ferro House as they appear today. Clearly the House of Tomorrow’s creator, George Frederick “Fred” Keck, wanted to make an impression. Keck was an ambitious young architect from Watertown, Wisconsin, who worked with his brother William in Chicago. He saw the fair as an opportunity to introduce Modernist architecture to the masses, and realized that, rather than working with just one manufacturer, he could get multiple sponsors on board and experiment with a wide range of new materials. Libbey-Owens-Ford, for example, supplied the glass. 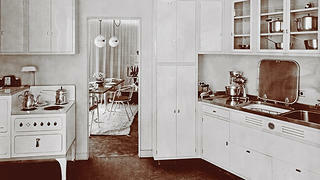 Goodyear provided rubber floors for some of the rooms, and General Electric contributed the latest appliances. Keck used an octagonal brick house in his hometown as an inspiration for the building’s unusual form, and the iconoclastic architect Buckminster Fuller’s Dymaxion House (1930) may have influenced him as well. The dodecagon came about for purely practical reasons; that shape simply worked best with Libbey-Owens-Ford’s available sizes of glass panes. 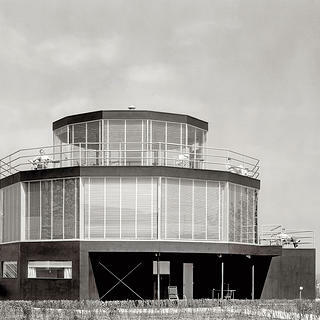 What Keck didn’t realize was that all that glass, exposed directly to the sun, would make the House of Tomorrow very hot. Apocryphal stories abound of the building’s construction workers stripping down to their shirtsleeves in the middle of a Chicago winter. During the fair, the master bedroom had to be closed to the public in the summertime because of soaring interior temperatures. 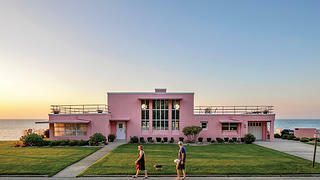 The flamingo-hued Florida Tropical House faces west onto Lake Michigan. On clear days, the Chicago skyline is visible across the lake. Today the House of Tomorrow sits on a grassy hillside, sandwiched between the Armco-Ferro House and the Cypress Log Cabin, and across the street from the lakefront Florida Tropical and Wieboldt-Rostone houses. Keck’s 12-sided sensation is currently covered in house wrap and plywood, the better to protect it from the stiff winds coming in off the lake. Rusted metal and peeling paint fill its decrepit interior, but engineering firm WJE has found that the house is structurally stable. It’s part of the Indiana Landmarks tour I’m attending, and most of the visitors seem to see past the decay to the sleek 1930s pad it once was and will be again, after an upcoming rehabilitation. “I’d love to see this when it’s done,” muses one woman as we descend the big spiral staircase from the second floor. Bartlett sold all five of the houses to individual owners, and they remained in private hands for decades. Federal legislation establishing the Indiana Dunes National Lakeshore, part of the NPS, was signed in 1966. In 1976, the Century of Progress properties were included as a district within the park. NPS purchased the Wieboldt-Rostone House outright, and it acquired the other four residences under its Reservation of Use and Occupancy program, which allowed the owners to remain in the houses for up to 20 years. In exchange, they agreed to sell the properties to NPS at a reduced price. The buildings had never been meant to last beyond the fair, so their construction quality was far from optimal. Their condition deteriorated throughout the 1970s and ’80s, even as they were still occupied. Like its next-door neighbor the Florida Tropical House, the Wieboldt-Rostone House looks directly onto the lake. Sublessee Ross Gambril, a former ironworker, restored and replicated all of the window frames and railings. Then the real fun began—selecting a group of people willing and able to trade conventional homeownership for the adventure of living in and restoring the houses. They and their families would get to live in a national park, right on (or across the street from) the lake for the next 50 years. Instead of paying rent, they’d shoulder the financial and logistical responsibility for the work themselves, and it would have to be done to the Secretary of the Interior’s Standards—the gold standard for preservation. Finding the right candidates wouldn’t be easy. Steel also makes up the main structure of the Wieboldt-Rostone House, which is clad in a composite stone made of pressurized shale, alkaline earths, water, and crushed limestone. “I’m an Art Deco freak,” says Ross Gambril, a former ironworker and Chicago hotel owner who became the house’s sublessee in 2004. “My dad went to the World’s Fair and my uncle managed a theater in Beverly Shores—I’ve known the history of ’35 for my whole life.” Gambril and his son Joe have been restoring the Rostone House with the help of more than 200 people, he estimates. They have about a year left to go before the work is complete. Christoph and Char Lichtenfeld at the Armco-Ferro House, with the House of Tomorrow in the background. 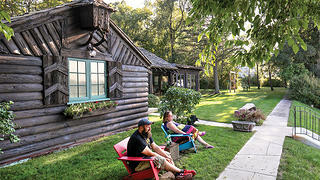 For Gambril; the Lichtenfelds; Bill Beatty and his wife, Lisa Kmak Beatty; and Flint and Jamie Alm (sublessees of the Cypress Log Cabin), life in the Century of Progress Architectural District has its challenges. Privacy is often at a premium, especially during the summer months, when day-tripping Chicagoans and vacationers from all over the country pour into the park. The restored widow's walk at the Armco-Ferro House captures breezes coming in off the lake. The elephant in this one-of-a-kind room, of course, is the House of Tomorrow, which has sat vacant since 1998. And in keeping with its status as the most unusual house at the fair, Indiana Landmarks has decided on a different preservation process for it. “We took the model that we used for the other houses and put it on its head,” Zeiger says. Instead of selecting a long-term lessee to do the preservation work, Indiana Landmarks itself will oversee the work—which still must meet the Secretary of the Interior’s Standards—over the next two years. “We feel we’ll bring the resources to the project and get it done quickly,” he adds. The $2.5 million rehabilitation will begin this fall, provided Indiana Landmarks can meet its fundraising deadlines. Once it’s complete, the house will be leased for three to five years at a time, giving more people an opportunity to live there. Residents likely will be required to open the House of Tomorrow to the public more frequently than the other houses, to help accommodate pent-up demand. The team’s historic preservation architect, Bauer Latoza Studio, has tracked down catalogs and records from 1933 to identify all the building products used in the house. Some of the companies involved—such as Goodyear and General Electric—are still in business, and the hope is that whatever can’t be salvaged can be replicated. Bauer Latoza is also talking to a collector of Vitrolite, the vintage material on the walls in the kitchen, to line up potential replacements. “We’ll be restoring up to 80 percent of the original house,” says Bauer Latoza principal Edward Torrez. Guests of sublessees Flint and Jamie Alm at the Cypress Log Cabin. The Southern Cypress Manufacturers Association sponsored the house’s construction for the World’s Fair to showcase the wood’s various uses. Changes to the first floor—adding a bedroom and an elevator, and transforming the airplane hangar into a functional garage, all within the original footprint—will be made with an eye toward long-term livability. Even more important are the updates to the HVAC system and the glass. bKL will use a combination of a ground-sourced heat pump and variable refrigerant-flow systems to dramatically reduce the energy needed to heat and cool the house without changing its appearance.